Whether you’re building a new home or remodeling, James Hardie siding provides low maintenance and doesn’t sacrifice the beauty and character of wood. James Hardie fiber-cement siding resists rotting or cracking and it resists damage from rain and hail. Our house siding is also available pre-finished with a 15-year paint warranty. Best of all, James Hardie siding is non-combustible, with a limited, transferable warranty for up to 50 years. No wonder it’s protecting over 3.5 million homes in North America alone. Everyone’s dream home is different. That’s why we offer a wide selection of exterior siding options for any home style. 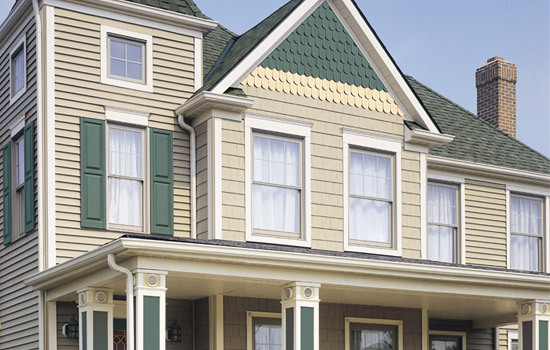 Choose from lap siding, shingle siding, individual shingles and siding accessories in a variety of appealing styles and colors. Our versatile product range also makes it easy to match an existing style or home siding type. So whether you’re just adding on or completely re-siding, James Hardie has an option that’s perfect for your home’s exterior. We use only the best siding available, such as CertainTeed or James Hardie, providing the highest quality product to our customers. Vinyl & Fiber Cement Siding allows you to enjoy your home without the added cost and worry of yearly maintenance. With a designer palette of colors to choose from, we're sure to have the look you always dreamed of. Call us today.